The U.S. government is the biggest customer in the world! How can your small business get a piece of the pie? 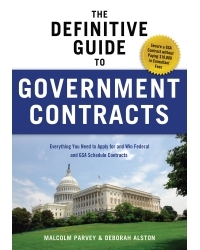 The Definitive Guide to Government Contracts begins at the beginning, and assumes no prior knowledge of the government marketplace. Written in a clear, easy-to-understand language by experienced sales and marketing professionals, it takes you through every step of the process—finding the opportunities; understanding the requirements; registering your company and submitting your bid; shipping, packaging, and invoicing requirements. As an independent sales and marketing professional, Malcolm Parvey has more than 30 of years experience helping small businesses sell their products and services to the federal government. He has completed hundreds of offers for clients from a wide variety of industries. He lives in Massachusetts. Deborah Alston grew up in Wales and graduated from the University of Wales, Swansea. She has lived in the United States for more than 20 years. She has worked closely with Malcolm Parvey for several years, and has coauthored all of his books.